Not too long ago I wrote a post entitled “Magic Words.” It was about the power of language, specifically, the written word. In it, I attempted to portray both the power and the beauty, the mystery and the logic… indeed, the profound as well as the mundane nature of the art. It is the art of the wordsmith. It was one of my deeper pieces and one that I still like – unusual for me, my worse critic. I have always looked for the secret formula, the one special phrase, those magic words that would snap my life to attention. It didn’t have to be in the form of the ever-popular “self-help” book, but that was, for a long time, where I sought them. It didn’t even have to be in the form of motivational or inspirational prose. If a special arch support or some B complex vitamin that had somehow eluded me was the answer, then I was all in. Oh yes, believe it, my head went there. Today I get it. I know the secret, and magic has nothing to do with it. 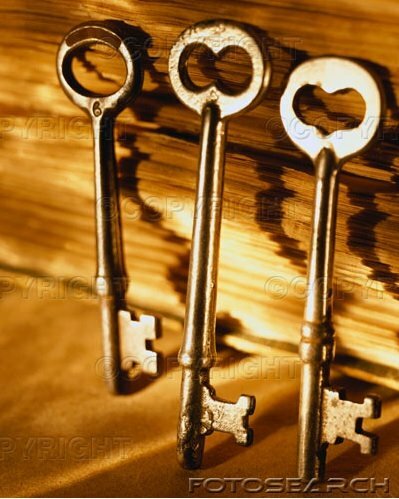 Three little words formed the key and the action dictated by them opened the door. Today represents an ominous anniversary for me. It’s a rather dramatic, and traumatic experience – so if that’s not your bag, don’t go here. October 17, 2006. It’s just another day – nothing too special about it, nothing special at all. Six years ago, October 17 was a day just like today. Not that it started just like today, or any other day for the past couple of years, but it was like any other day six years ago. Chaotic, hectic, rambling and haphazard were among the adjectives one might have used to describe my life at the time. No matter what it may appear in retrospect, in the moment, it was a day like any other; a perfectly normal Sierra autumn day. It would not remain so for long. Before the crisp morning chill even had time to be tempered by the autumn sun, my world drastically changed. My life nearly ended that day; it hung precariously by a thread in the days that followed. I was 37 years old in what should have been the prime of my life when, in a split second, everything changed. My lifestyle in those days, as I alluded to earlier, was busy. It didn’t need to be, but it was. I was tired that morning – really tired. I wanted both of my younger sons (my oldest was 16 at the time and living with his mother) to be sick that day. I was tired and I knew it. I knew from experience that all I needed was a couple of hour’s sleep and I’d be ok. Although I don’t recall for sure, I’m pretty sure I suggested to my kids that they might not be feeling well that day. My kids have not experienced a great deal of stability growing up. A single father brought them up for most of their formative years. We moved frequently. They have all had difficulty with school, maybe as a result, maybe not. The point is that when a day off of school is thrown their way, it is readily accepted. My 11 year-old took the gift without reservation. His brother however, threw me a curve. He went on to explain that he was behind and couldn’t afford to miss a day at school. I guess that last round of reactive proactivity was effective. I had no choice; I had to get him to school. It wasn’t as though I thought I couldn’t make it, it was that I didn’t want to. My inspired parenting left me little choice, and I couldn’t even be angry with him – he was the responsible one. Of course, once my little one was sick, he wasn’t planning on getting better right away! It was cool that morning. The snow was going to be coming in just a few weeks and the Sierra was preparing herself. We were looking forward to an early and long winter – the snowboard equipment was already prepped. On State Route 89, there is a long, sweeping, right-hand turn; the Truckee River was to my left and the mountainside on my right. The police report and the truck driver said that I was asleep. I never turned when the road did. I went straight into the path of an on coming, fully loaded logging truck. The truck driver went as far to his right as he could, but he was not able to avoid me. I wasn’t expected to survive. I lost most of my blood due to internal injuries and massive bone trauma. They say I was in and out, I really don’t know. I remember some sketchy bits and pieces, but I can’t say what was real and what was not. Everything that I know is second hand. Since this is not intended to be a thriller, I’ll say right now that my boy walked away with relatively minor injuries – physically. Six years later, it’s almost like it was a dream. 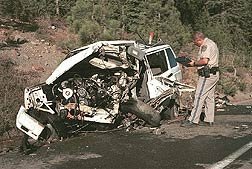 I was “revived” (I had no head injuries; but I was very heavily sedated) about five weeks later. I was confused to say the least. I had all kinds of machines and tubes and hardware sticking out of me. I discovered later some new little scars that were from the minor injuries I had sustained. By the time I came to, the stitches and the scabs were gone – just new scars were left behind. I had a full beard… and I couldn’t talk because of the tracheotomy they had to perform. I was constantly thirsty. I slept through those five weeks, but my family lived a very real nightmare. I was blissfully unaware – my nightmare began after I realized exactly what had happened – and why. Although there is a whole lot more to this story, this brief “readers digest” version is only the beginning; it is one that has no ending. It could have been the end, but for reasons I can’t even begin to explain, it was just the beginning. It sure didn’t seem like it at the time – six years ago today. I had a midterm this morning. Just five or six weeks into the semester and up pops a midterm. How rude! I wasn’t ready for it, it snuck up on me and besides… it’s not time for midterms yet, dammit! But it wasn’t a surprise. In fact, the professor warned us that it was early and to be ready for it. He did this on the first day of class five or six weeks ago. Ever since then, he has been reminding us every week. I knew it was coming; I knew when, and because he provided a study guide – I knew what. There was ample time to prepare and I spent that time – on other things. No worries, I know how to cram and in all fairness, when I’m in class, paying attention, taking notes and asking questions, I am in a state of perpetual readiness. I have done these things and my “base” knowledge is good, but in this class it’s not enough. So for the last few days I’ve been doing the reading I didn’t do and answering the study guide questions… mostly. Finally, last night I seriously buckled down. It wasn’t “too little, too late,” it was more like “too late to do too much.” I got a lot done and I think I can safely say I passed, although I couldn’t even guess as to what my grade will be. That is, by the way, a frightening statement – I usually know if I nailed it or failed it. Anyway, I had time this morning for a quick cram session. All would be well. Kid and dogs however, are smart. They know when the gettin’ is good. That leaves me all by myself with the insanity of the disappearing keys. With no other real option except missing the test, I change gears and get my Harley out of the garage. It is time for a solution and tearing up my house when I have to be at school is not a good one. Riding my bike in rush hour traffic down U.S. 50 to get to school is not my idea of fun, but in this case it was a necessary evil. So I made it in time – not with the study time I planned for, but in time not to be late. I took the test – dunno how I did. I will be prepared next time – know that. I got home in the early afternoon – called AAA and found that their service was not only inconvenient, but the most expensive option, even after their $100 is taken into consideration. I called my son and sheepishly asked him for a ride to the Toyota dealer to get another key. Done. Now I have wheels, but it’s too late to go to work. I settle down into my office at home and move a couple pieces of paper. That’s right! Bingo, there they are. 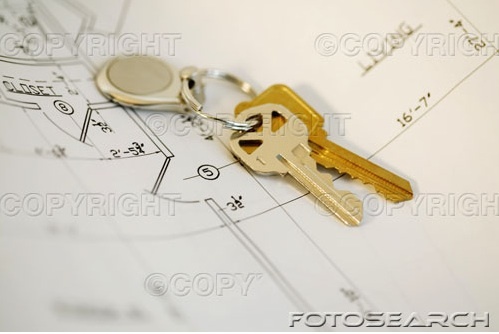 Then it’s off to the hardware store for – you guessed it – spare keys! The moral of this story? A lesson learned sometimes means experiencing the consequences before the knowledge is put into practical use. Knowledge? I know I need spare keys. Consequence? Losing them when I need them - desparately. Pactice? 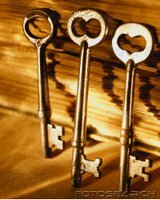 Get the new keys made not now, but right now! Saturday, Oct. 7 was a sad day. An icon in the retail music business began the final phase of a process that will eventually erase its existence and bring an end to an era. Tower Records is having its going-out-of-business-sale. Although it has valiantly tried to hang on in the wake of the digital revolution, it reacted perhaps too slowly to the changing landscape of the retail music business. The result of Tower’s attempt at Chapter 11 bankruptcy protection? Liquidation. 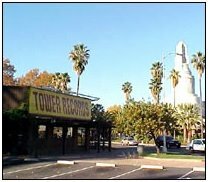 I didn’t know it at the time, but the Tower Records constructed across the street from the San Antonio Shopping Center in Mountain View, Calif. (my childhood "backyard") was not far from where it was founded – right here in Sacramento (my current "backyard"). All I knew was that for a kid who was not yet old enough for a driver’s license, who’s only means of transportation was a bicycle and walking, the placement of a record store less than a mile from home was a godsend. It was not long before I had discovered, quite by accident, rock and roll on AM radio. KFRC in San Francisco was spinning top 40 in the early 70s (does anyone remember the late great "Dr. Don Rose? "), and although it wasn’t the kind of rebellious music I would eventually gravitate towards, it was the spark that ignited the fire. 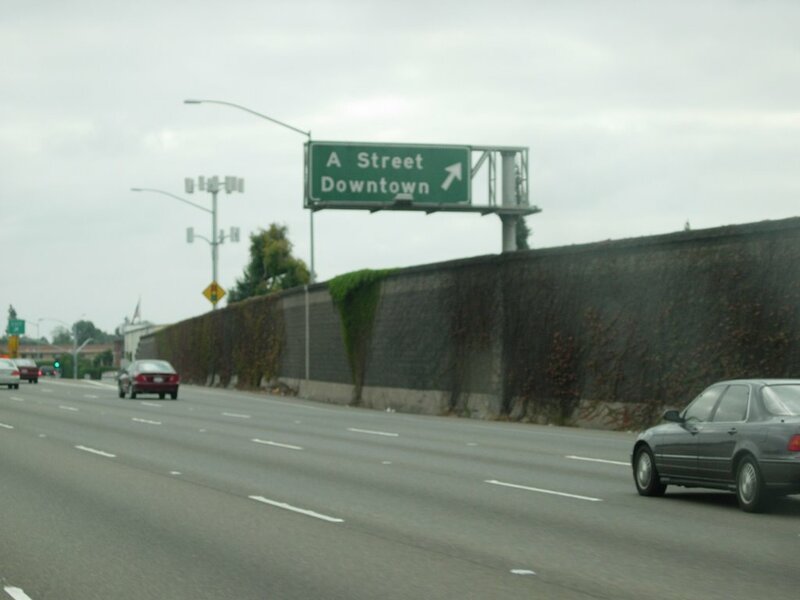 Soon enough, FM radio became the norm for music, rock and otherwise, and stations like KSAN in San Francisco and KOME and KSJO in San Jose were spinning the records that would become synonymous with my coming of age. And Tower was where they could be found. Eventually I discovered the section of the store that contained the posters and psychedelic art that would cover every inch of drywall in my bedroom. Although we didn’t call it one, many referred to it as a “head shop,” and the name was fitting. As societal norms changed, so did Tower’s product line. Paraphernalia was no longer sold at Tower as California passed a weak, but temporarily effective anti-paraphernalia law. However, the law and society did not remove Tower from the fringe of what was considered acceptable as many items could be found at Tower that were found nowhere else. 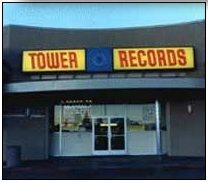 As the retail music landscape evolved, so too did Tower. 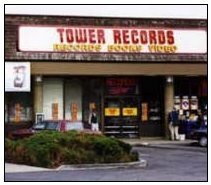 Other music stores began to disappear… The Wherehouse, Musicland, The Record Factory and others were closing their doors, but not Tower. Tower had the name, the attitude, the selection and a certain je ne sais quoi that no one else did. When my favorite bands would come to town for a concert, it was at Tower that they made their guest appearances. Back in the days of analog… before CDs and DVDs and MP3s and iPods and even the venerable Sony Walkman – when the 8-track player was giving way to the cassette tape, music came on vinyl. The packaging allowed for cover art that was large enough to be displayed. The Internet was in its infancy and the World Wide Web? No one knew. Memory and storage was measured in kilobytes – digital music was only a dream. Even when CDs first made their appearance, there was significant resistance to this “un-pure” medium, with some insisting that their refined musical ear could differentiate between digital and analog reproduction. Those promoting the new technology as “indestructible” were equally misinformed, but technology marched forward nonetheless. My generation grew up transferring analog vinyl to analog cassette tape to bring our music with us and share it. Even then, those in the business of music viewed this innocent reproduction of music as a threat to their income, ultimately squashing not the analog cassette, but it’s digital offspring, the digital audio tape (DAT). Although the fears were perhaps well founded, the industry chased the wrong rabbit as the digital revolution entered its own with the high-speed, long distant transport of millions of bits of data – musical data – at the click of a mouse. Unfortunately, it was the ultimate reality of this transfer of data that rendered the Tower Records of yesterday naught but a relic today as we upload and download our music via the World Wide Web. We have, in our rush into the future, left behind our “high overhead” middle man. Music stores like iTunes consist of software, servers and electronic fund transfers. No longer is that pimply faced kid with the green mohawk and the bad attitude there to assist us in locating that hard to find import or some obscure group that no one has ever heard of. It can now be located with the click of a mouse and the whirr of a hard drive… and if one is very clever, often at no cost. I’m going to miss Tower Records. It’s a sad day. However, progress is a fact of life and mourning the loss of days gone by is not a productive use of time. Neither, it would appear, is going to the record store. Eight days. 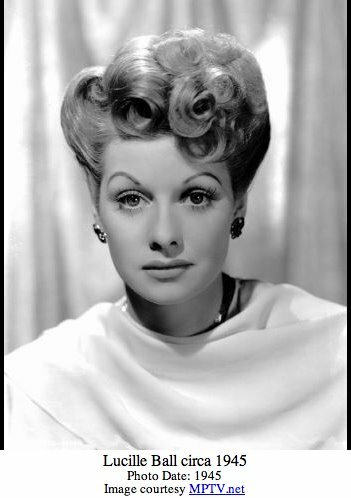 Unless you count the Lucille Ball quote, I haven’t posted anything (here) in eight days. Regular readers (and bloggers) know that the nature of this forum is that participants come and go… some come back and many just disappear. I have not disappeared; like the Cheshire cat, my smile still remains. Yesterday, however, even that was in danger of fading. I had every intention of writing the post of all posts, the blogger’s blog, the piece de resistance, the coup de grâce, even… the cat’s meow. Alas, nothing. I dropped back and punted. I pulled an old rabbit out of my hat with an ironic twist. I used to find famous and not so famous quotes and post them here with a portrait that I unashamedly stole from somewhere in cyberspace. Often it applied to something I related to or was experiencing during that moment and other times it was simply a backhanded way of saying, “Look how smart I am.” Yesterday it was all that and something more. It is true that I am extremely busy. It is also true that I have been under a lot of stress of late. And some of it is self-imposed. The need to put up something, anything on this blog was manifested in trying to combine the profound with reality and use it to say, “Here, this is why I’m not maintaining this blog,” with a quote that states I should be able to do it and more because I’m so busy. Whew! Hold on, I’m not even done yet. All this begs the question: To whom do I owe these regular pearls of wisdom? Me? Good one! I already know. The world? It has done nicely without my commentary for a very long time. Even my regular readers know (as you all are among the smartest people I know) that I owe you nothing. There is not and never was any external pressure to write anything for this space. It was all me. The point of all this is simple enough. I have embarked on a career as a writer. At the moment it is primarily news writing. I have very real pressure to do most of the writing I do – I get that and its ok. This space was originally setup for my pleasure and inner peace. It has, due to my own warped perception of duty, become a chore – until now. Today I rededicate this space to pressure free, freestyle and free form writing. There are no rules, no structure and most importantly… no deadlines. My postings will come when they come and won’t when they don’t. I don’t have to nor will I conform here. (Self? Are you listening?) There, I fell much better now. "If you want something done, ask a busy person to do it. "